Say kia ora to romance in charming Russell, a favourite for those that want to get away from the crowds and haste of Auckland and enjoy secluded, natural beaches. If you are driving from our largest city and you missed our guide to driving from Auckland to the Bay of Islands, check it out before continuing on to Russell below. Russell is a small peninsula accessible by via vehicle ferry at Opua or by driving through Russell State Forest. Let’s look at these options in more detail below. You’ve had your rest stop in kitschy Kawakawa and you are quite keen to continue driving. After all, the views seem to grow more and more beautiful as you head further north and it’s nice to cruise through the changing scenery. If you would like to drive to Russell rather than take the vehicle ferry, you will need to follow State Highway 1 to Old Russell Road in Whakapara. From here you will follow the the Old Russell Road through the dense state forest. You can take this road all the way to Russell directly, however, we highly recommend a rest stop by turning onto the Whangaruru Wharf Rd in Whangaruru to take in some of the breathtaking coastal scenery here before continuing on. If you’d prefer to take the coastal route and stop in at Opua, the vehicle ferry is for you. 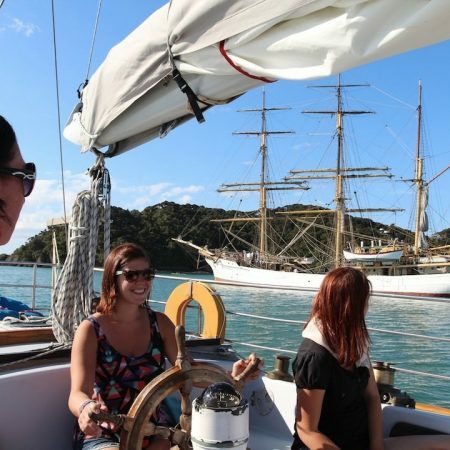 Opua is the most popular port for those who choose to reach the Bay of Islands by sea. In fact, it is commonly the first port for those who have sailed across the Pacific. It remains a busy destination for cruisers due to the deep, sheltered waters and the plethora of facilities for visiting sailors. While a pretty place to stop, Opua also serves as the easiest means of car access to Russell. Cross from Opua to Okiato with your car and take the short drive through the beautiful peninsula to historic Russell. From the harbour settlement of Opua you can take the vehicle ferry across to Okiato and continue on you way to Russell via Aucks Road. For those travelling by bus or on foot, there is also a passenger ferry from Paihia to Russell however this does not allow for cars to cross. Russell holds much historical significance for New Zealand. Formerly known as Kororāreka, it was the first sea port in New Zealand and Okiato (where the ferry arrives) was the first New Zealand capital! Not bad for such a cosy town. Here you can take it easy with a casual stroll along the water, enjoy the unique cafes and restaurants or simply find a nice spot in the sun for a picnic. If you feel like exploring, park the car and take the passenger ferry across to Paihia. Step back and see Russell from the opposite side of the harbour. Whether Russell is your final destination in the Bay of Islands or simply your first stop, know there is plenty to keep you entertained and relaxed on the Bay of Islands golden shores. Why not continue on to Kerikeri? Or even right to the most northern tip of New Zealand where the Pacific Ocean and Tasman Sea collide! There is even a clearly visible line between the two. Whatever your choice, we trust you’ll love the Bay of Islands as much as we do. You can click on the little star next to where it says Russell at the top of the map. This will save it to your Google Map (You will need a Google Account for this). Scroll across and click on the Maps tab and you should see Russell there. Now when you are in the Menu you should see Russell just above the Traffic option now.